Copy of the photograph of early twentieth century electrical engineers, mounted at the EG&G Building (Bld. 34) at MIT. (CC) Bob Edgerton adds, "Professor Vannevar Bush is on the left wearing glasses. 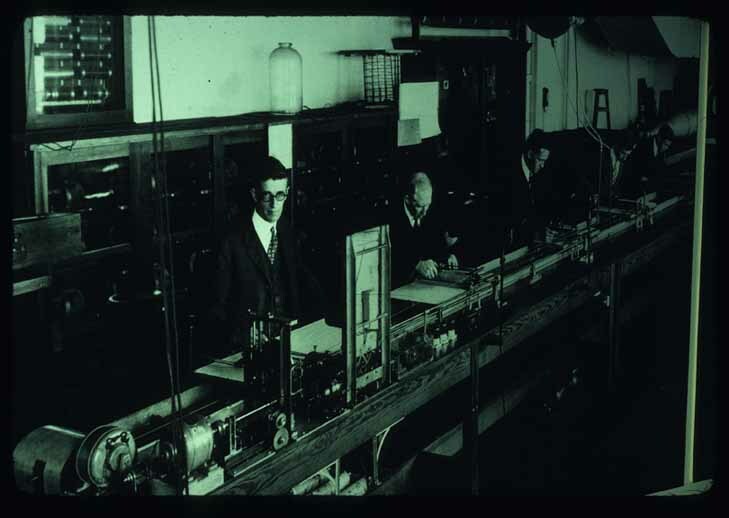 They are operating the Integraph at MIT 1929. This was an analogue computer that Professor Bush had invented. HEE used this machine to solve some elliptic integrals that described the motion of the synchronous motor when disturbed by a pulse of current. The operation of the integraph required several people as shown above, and my mother assisted my father when he was solving his equations on this analog computer. Hewlett was a student of Professor Vannevar Bush and pursued the digital computer concept."